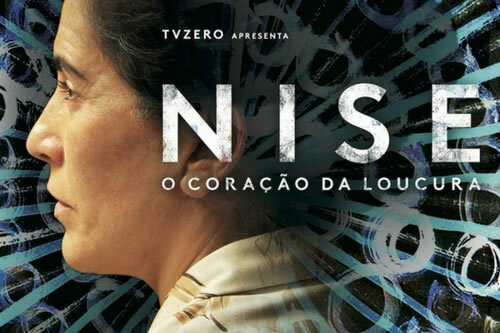 Brazilian director Roberto Berliner attended a screening and discussion of his most recent film, "Nise: O Coração de Loucura," which tells the story of the revolutionary female psychiatrist Nise da Silveira. "She did so many important things in Brazil that I wanted to tell everything, but making a feature film I just didn't have time, so the first few scripts did not work." 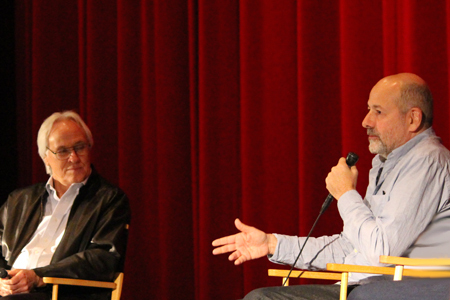 UCLA International Institute, February 22, 2017 — As part of an ongoing film series organized by the Center for Brazilian Studies, director Roberto Berliner’s new feature film, “Nise: O Coração de Loucura (Nise: The Heart of Madness),” was shown at the UCLA James Bridges Theater on February 1. The film series, currently in its 10th year, is cosponsored by the Brazilian Ministry of Foreign Affairs through the Consulate General of Brazil-Los Angeles, and the UCLA Department of Spanish and Portuguese. The biographical drama tells the story of Nise da Silveira, a Brazilian woman who revolutionized the practice of psychiatry in the country during the 1950s. 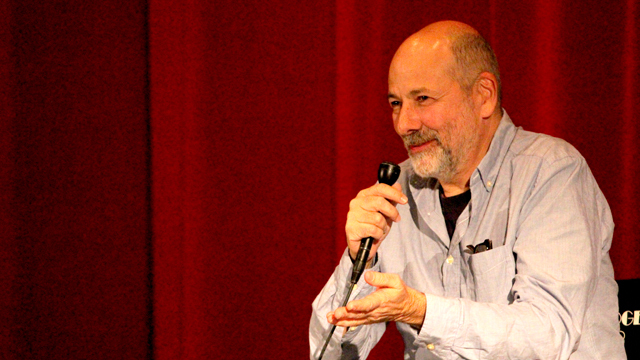 The film was followed by a brief discussion period with Berliner. Nise presents snapshots of the period in Nise da Silveira’s life in which she began working at an infamous psychiatric institution in Rio de Janeiro. Upon her arrival there, Nise is shocked by the conditions that the psychiatric patients are forced to live in. She is also horrified by the practices that her male colleagues use to treat patients with schizophrenia. Guided by her rebellious spirit, da Silveira refuses to practice electroshock therapy or to perform lobotomies on her patients. Instead, she develops a unit for occupational therapy in the hospital. Despite multiple setbacks and a detrimental lack of support from her colleagues, she is able to help her patients create beautiful meaningful works of art. This art becomes not only an extremely successful therapeutic practice for schizophrenic patients, but also becomes recognized and celebrated for its value by the art community. 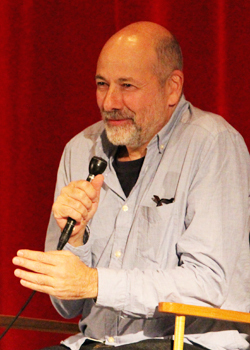 As a Brazilian artist who was familiar with the impact da Silveira had on the art world, filmmaker Berliner said he already had an interest in her work and her life before he made the film. It was only after he visited the real Casa das Palmeiras (Palms House), the unit where psychiatric patients created art, however, that he began to consider her story as a serious project. Berliner tried to involve as many people as possible in the project who could help him better represent da Silveira’s story. People who had worked with her collaborated with him and became deeply involved in the project. Together, they studied over 350,000 pieces of art that are still in the hospital museum today, as well as her old hospital documents and patient records, to make sure that her story was told properly. According to the director, many people very close to the Brazilian psychiatrist gave input on the script and provided important details that brought her to life on the big screen. Trying to paint an accurate and meaningful picture of da Silveira was no easy task. “She did so many important things in Brazil that I wanted to tell everything,” explained Berliner, “but making a feature film I just didn't have time, so the first few scripts did not work.” This experience explains why seven different writers are credited on the final film. Although the project took years to make and required the collaboration of dozens of people, it was completed nonetheless, and has been racking up both Brazilian and international awards since its release. The actress Gloria Pires in a poster for the film. Gloria Pires was actually Berliner’s second choice for the lead, even though her performance turned out to be exactly what he wanted. Pires is one of the most famous actresses in Brazil and is the only big name in the film, because, said Berliner, the filmmaking team went to great lengths to cast actors who were mostly unknown. Shooting the film was an arduous process, but a positive experience in the end, remarked the director. They shot for 12 hours each day, 6 days a week, for a total of 7 weeks. The entire movie was filmed in the actual hospital in which Nise worked and Berliner stressed that the hospital continues to run today in the poor conditions shown in the film. During filming, the hospital also continued to house psychiatric patients. Berliner asserted that this was integral to the filming process because the patients became incorporated into the crew. The director recounted the experience of one of the most aggressive patients in the hospital. While Berliner and his crew were filming, they decided to give him a radio. “It really helped him to be involved, but he also really helped [the crew],” he said. In the end, the experience of filming in the hospital created an incredible sense of togetherness among cast and crew, making them extremely close. “It’s something that I think is forever,” said Berliner of the camaraderie. After the movie was completed, one of the first screenings took place in the courtyard of the hospital. The courtyard was featured in one of the most touching scenes in the film, in which Nise discharges one of her patients for the first time and the entire unit holds a farewell party for him. In parallel, the current patients were all invited to the screening and watched alongside the cast and crew. This moment was particularly meaningful for Berliner. “They made dialogues with the film. They spoke and talked to the film [as it was screening]. It was something really special,” he recounted. Along with the hospital, the museum that houses all of the patients’ art still exists in Brazil. In fact, all of the finished paintings exhibited in the movie are originals made by Nise’s real-life patients. They eventually became very important artists in Brazil and their art gained critical acclaim from artists all over the world. Berliner asserted that in addition to revolutionizing the practice of psychiatry, Nise’s work changed the way both art and artists are seen in Brazil. Lots of artists went to the occupational therapy unit to study the art there. The profits made by the museum were then redistributed into the program’s budget to keep the occupational therapy unit open in subsequent years. Now, Berliner hopes the film will help keep the museum alive for even more years to come.